Do you have a special mug for the holidays? If you do just forget about that one and look at this Doctor Who mug. The dark blue mug has Christmas details like Christmas trees but there is more exciting stuff on there for Doctor Who fans like you. There are rows of Sonic Screwdriver and you can find images of Dalek, Tardis, Cybermen, and Weeping Angel. A mug like this almost looks like an ugly Christmas sweater and even the images look a bit pixelated to add to the look. 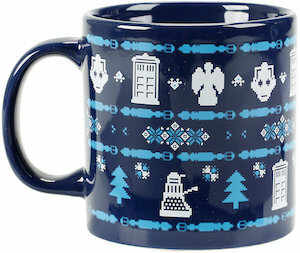 Morning coffee and afternoon tea will be so much better when served in this Doctor Who Christmas mug.